Many dogs don't know they have back feet! They go where their noses and eyes lead them, and everything else just kind of follows. While a Ladder isn't a regular agility obstacle (used in trials), many trainers use the Ladder as the very first obstacle for beginner dogs, to encourage their confidence. Trainers will also use the Ladder for advanced dogs to help them space their steps and place their feet down more accurately. By learning to pace himself inside the Ladder's rungs, your dog will gain confidence on the dogwalk, teeter, or any obstacle where it must use all four feet quickly and accurately! The Ladder is 7 feet long with rungs spaced 12" apart (good for any size dog), and it stands a few inches off the ground. 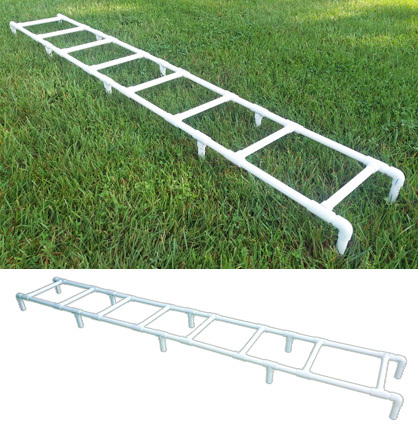 In addition, the Ladder can be turned upside down for small dogs, puppies or initial training. Comes with easy assembly instructions and training tips. TO ORDER: Type quantity & Click add-to-cart button!